This October, Mike and I took our first big trip outside of North America to his top bucket list country: Japan! There was a ridiculous seat sale over the summer, for flights departing September through November 2015 to Osaka. We got our flights (arrive in Osaka, depart from Tokyo) for just $800 per person (STEAL of a deal especially considering East Coast Canada flights can be pricier than that). It was a very memorable experience, and I’ve put together a list of some of our highlights / travel tips and what I think you should do if you visit this beautiful country! Delicious pork ramen from Ichiran in Dotonbori, Osaka. We were not huge ramen eaters prior to our Japan trip but I imagine we will be after. 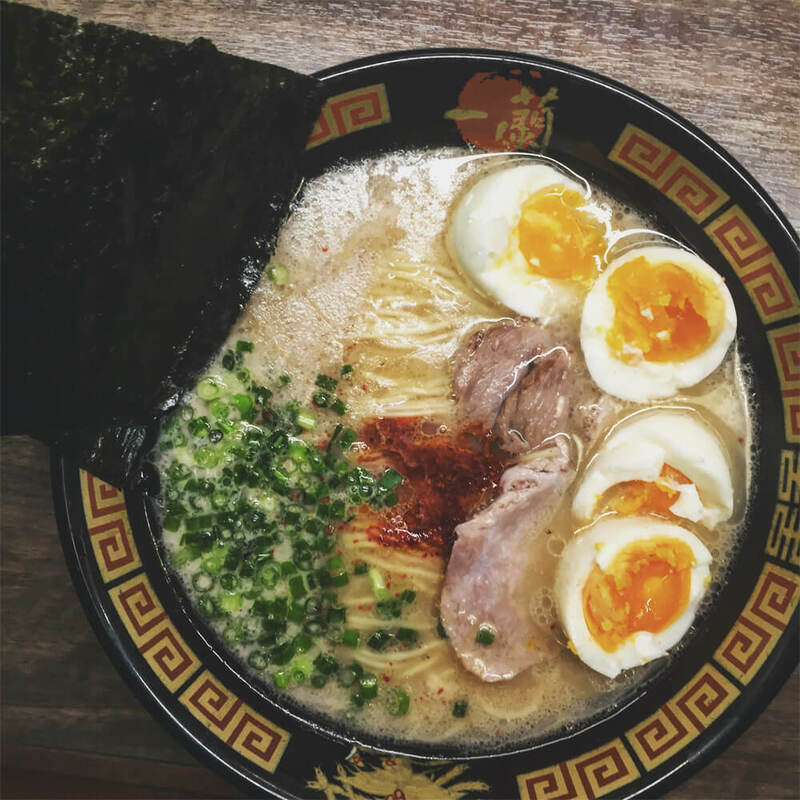 In Japan, ramen was everywhere. I felt like a ramen restaurant was easier to find than a sushi place! Some were better than others (broth less oily, noodles more done, options featured more variety) but our favourite spot we tried was at Ichiran Ramen, a very popular chain ramen restaurant. You get to customize how you want your ramen exactly (spice level, garlic level, noodle doneness, etc. ), order from a vending machine and sit at secret looking stalls where they slide open a window to pop the ramen out to you. At almost every ramen restaurant we went to, we also ordered gyoza. Gyoza is damn good in Japan. Shibuya Scramble / Hachiko Statue A visit to Tokyo is not complete without checking out the famous Shibuya Scramble (Shibuya Crossing, Tokyo Time Square). Literally the intersections are packed in all directions with people. It’s an iconic Japanese scene, and you can view it from the second floor Starbucks across the street from Shibuya Station too. It’s memorizing. Before you cross the street though, stop by and pay tribute to/take a photo with the statue of Hachiko – a famous Japanese dog with a very sweet and sad story. I cried reading about Hachiko on the train getting to the statue. 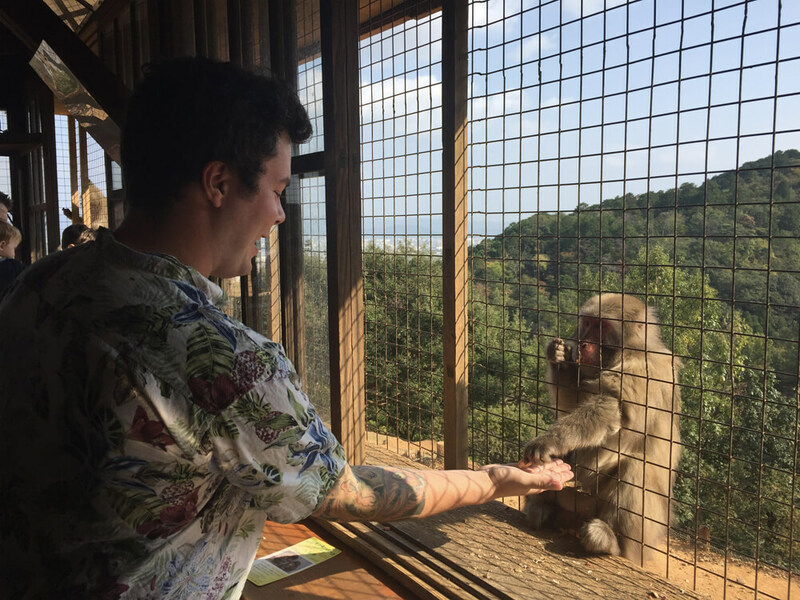 Feeding the monkeys at Arashiyama Monkey Park in Kyoto. Cycling through Arashiyama & Visiting the Monkeys I really appreciated the quiet moments of our trip. So much of where we went was noisy and busy so our afternoon getaway to the small town of Arashiyama, Kyoto was so pleasant. Rent a bike as soon as you get off the station and ride around town – checking out the shops and restaurants, but more importantly, hiking up Mt. Arashiyama to see the Japanese macaque snow monkeys. More than 100 monkeys live freely up the mountain and after about a 20 minute hike up (I was exhausted, but the monkeys are worth it) you can go inside a little building and buy snacks to feed the monkeys. I like how in this scenario us humans/tourists are the ones caged in and the monkeys are free. In Arashiyama, you can also walk/cycle through the beautiful Bamboo Groves. 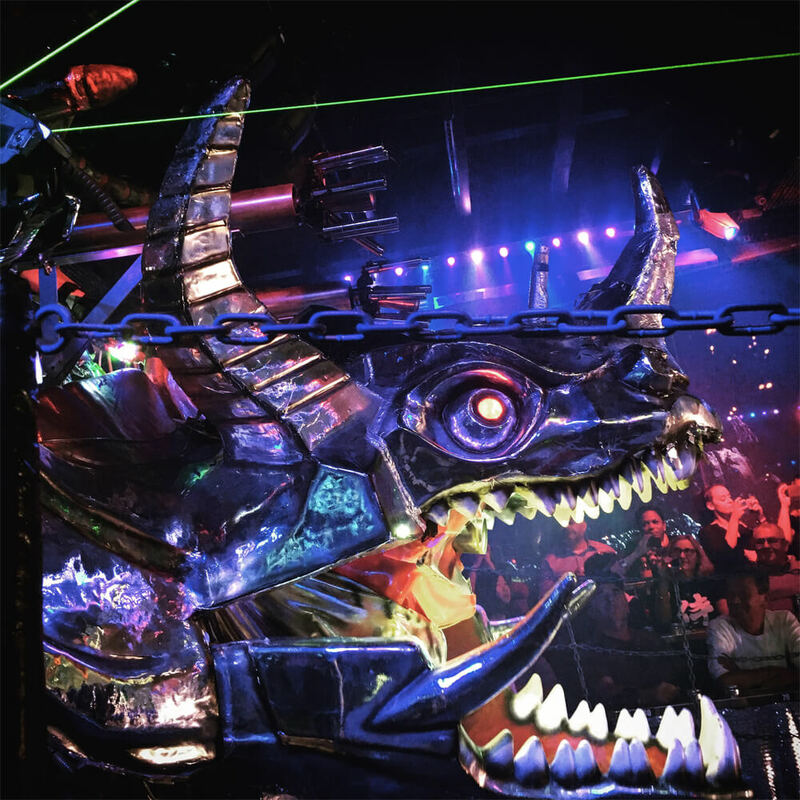 The amazing robot restaurant show in Shinjuku, Tokyo. Robot Restaurant Shinjuku It’s totally ridiculous, bizarre, jaw-dropping, lol-inducing and incredible. We had a blast at the Robot Restaurant in Shinjuku! Robots, lasers, dinosaurs, pandas riding cows (seriously lol), dancing Japanese girls in elaborate outfits and more! Go to the Monday 4 p.m. show to get a slight discount and don’t get the dinner – there’s lots of great places in the district you can eat at before or after the show! Enjoying the waterfront at Odaiba, Tokyo Bay. Odaiba/Tokyo Bay Similar to Arashiyama, a visit to Tokyo’s man-made island of Odaiba provided a lovely quiet getaway from all the hustle and bustle of the rest of our trip. Check out the shops, walk along the waterfront, even have a “beach day” at the harbour or hop onto a ferry for a ride around Tokyo Bay. It was also in Odaiba where we had our first amazing Kaitenzushi conveyer belt sushi experience in DiverCity. 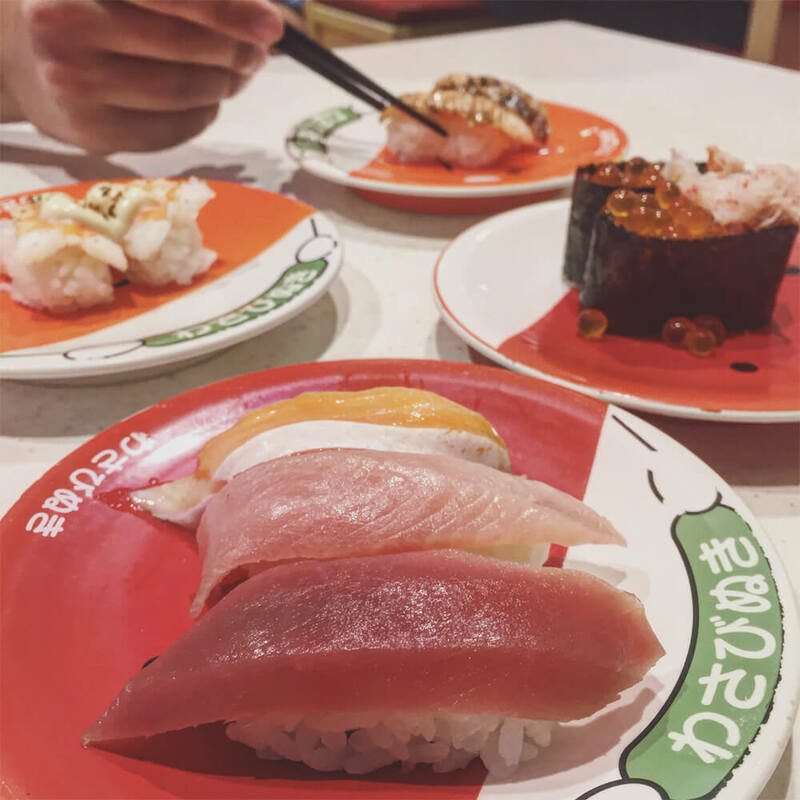 All the delicious conveyer belt sushi in Odaiba, Tokyo. Conveyor Belt Sushi Our favourite was a place called KAIO Kaitenzushi, which not only had your typical conveyer belt sushi delivery but also an adorable plastic mini Shinkansen bullet train bringing you orders at high speeds. Adorable! And delicious. And quite affordable! Mike was a big fan of their slightly broiled salmon. At really affordable prices (between $2-$5 per plate), we definitely got our money’s worth here. The freshest fish at Tsukiji Fish Market in Tokyo, Japan. There is nothing like having the freshest raw fish/sashimi at Japanese fish markets. In Osaka, visit Kuromon Market – where you can get oysters shucked right before your eyes. 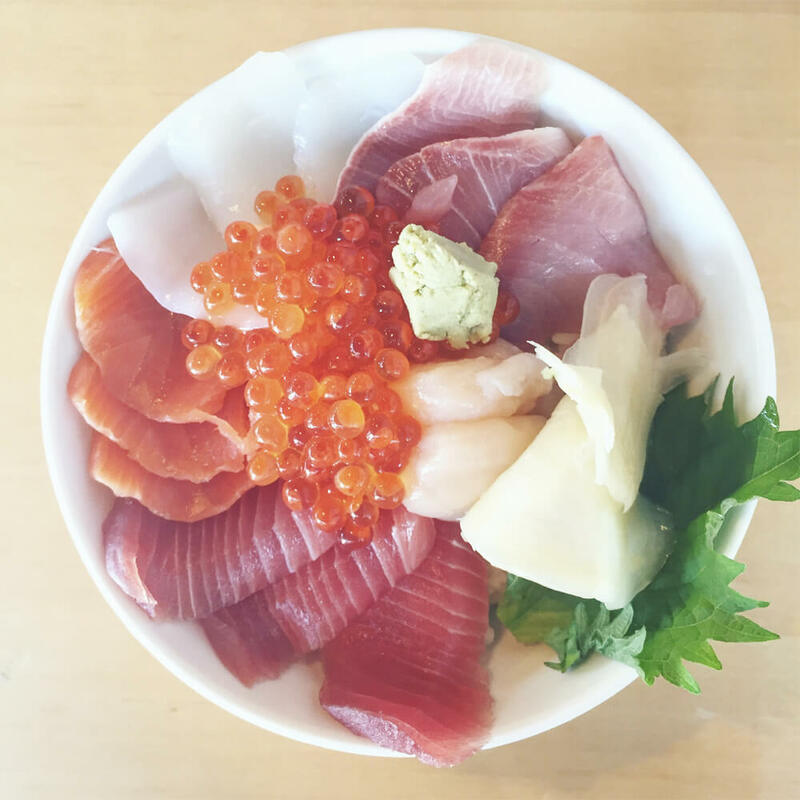 I had a chirashi bowl there where the stall owner sliced up the fish right after I ordered, and his elderly father was showing what I assumed to be his younger son the proper way to sharpen a Japanese chef knife. The market is known as ‘Osaka’s Kitchen’ with its variety of food stalls. In Tokyo, visit the famed Tsukiji Fish Market, and find one of many food stalls for raw fish that literally came in at 3 a.m. that morning. I became a big fan of salmon roe while in Japan too – finding it much juicier and more flavourful than roe in Edmonton. Careful you don’t go on Sundays when the market is closed (like we initially did) and they are also closed some Mondays, so check their website before you go. Dotonbori Canal at night in Osaka. My two favourite area in Osaka was Dotonbori in Namba (Minami/South Osaka). 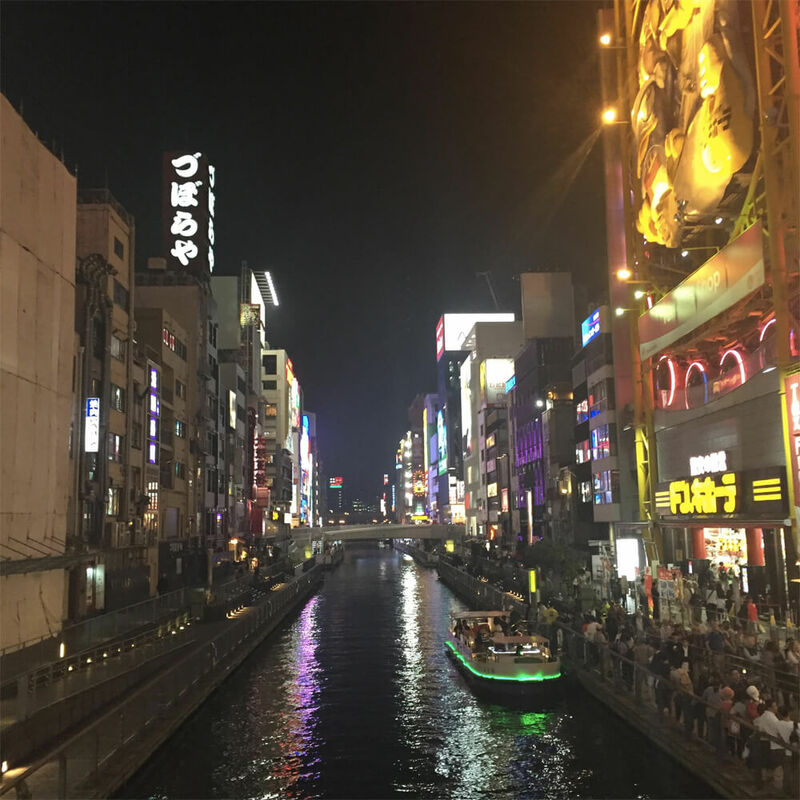 The street runs along the Dotonbori canal/river, with restaurants everywhere you look. A great spot for Osaka nightlife, hundreds of signs are lit up at night. In Namba we also had a great meal at a stand in Namba station – in Japan in general, be sure to explore the different shops and eat at restaurants right in the Japanese train stations. A trip to Japan is not complete or a cat lover without a visit to one of Japan’s many cat cafes. We visited five during our short stay in the country! I’d recommend Cat Cafe Calico or Nyafe Melange in Tokyo, and Neko no Jikan in Osaka. 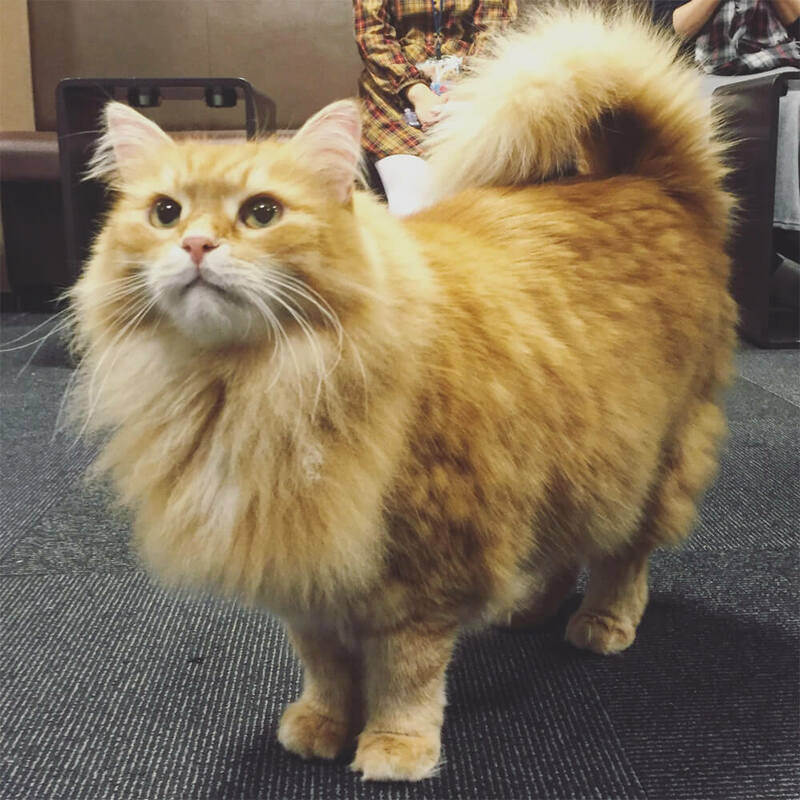 Read more about my visits to the Japanese cat cafes in a guide I wrote up here. There are also some other unique animal cafes/parks in Japan – including a deer park, fox park, rabbit cafe, and dog cafes. 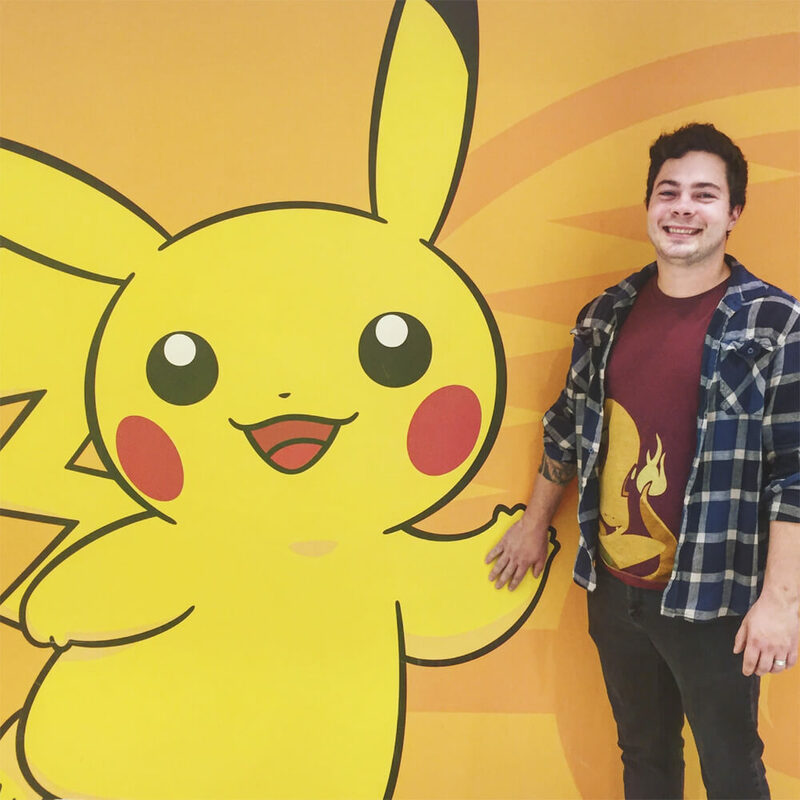 Mike in his happy place, at the Pokemon Mega Center in Tokyo. Japan has so many novelty, themed restaurants, cafes, and areas, you’d be missing out if you didn’t go to a few. Embrace your inner otaku (geek). We did – by visiting the world’s largest Pokemon Center (though Mike thought it could’ve been bigger/featured more) and Namjatown, where a special Sailor Moon-inspired menu was being served. Have an interest in ______? You fill in the blank, I bet there’s some kind of cafe or restaurant for it in Japan! (I know there is a prison-themed restaurant and a vampire cafe, for example). Beautiful Tokyo Tower lit up at night! This tower is gorgeous lit up at night! 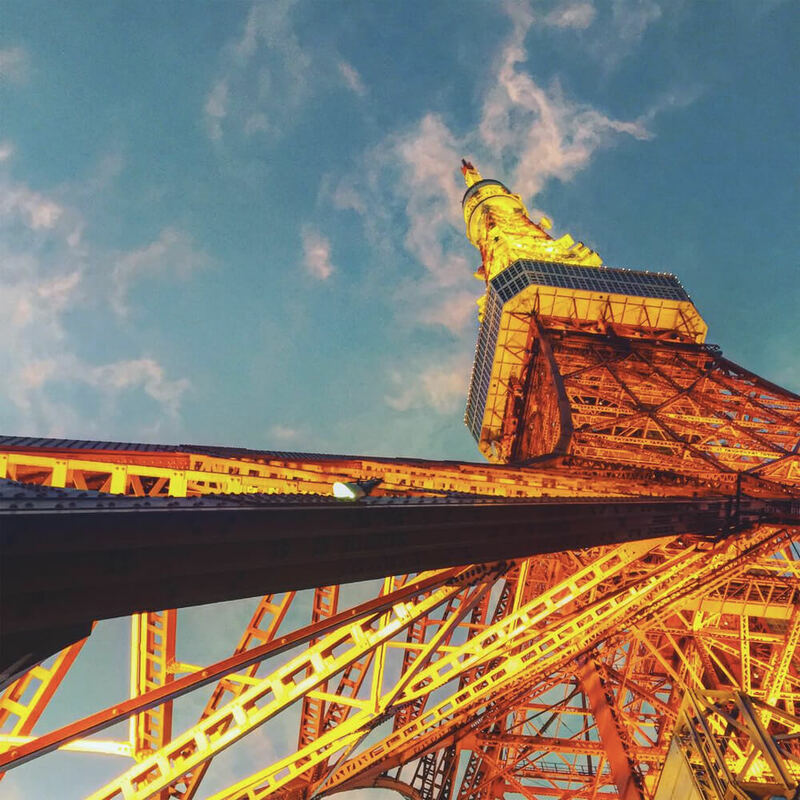 Meant to mimic the design of Paris’ Eiffel Tower, Tokyo Tower is actually taller than the Eiffel Tower and you can go as high up as 250 meters to get a stunning view of Tokyo. (We only went up 150 meters because Mike isn’t a big heights fan). I’d also recommend this over the newer Tokyo Sky Tree, as lines and prices were significantly shorter and lower at Tokyo Tower compared to the Sky Tree, though do visit the Sky Tree area and check out the shops. Having a blast at Karaoke Kan in Shibuya, Tokyo. Mike and I had a blast singing karaoke at the Karaoke Kan in Shibuya – at a cost of $1 for 30 minutes! Ridiculously cheap (like I felt like we were robbing them) but loads of fun. 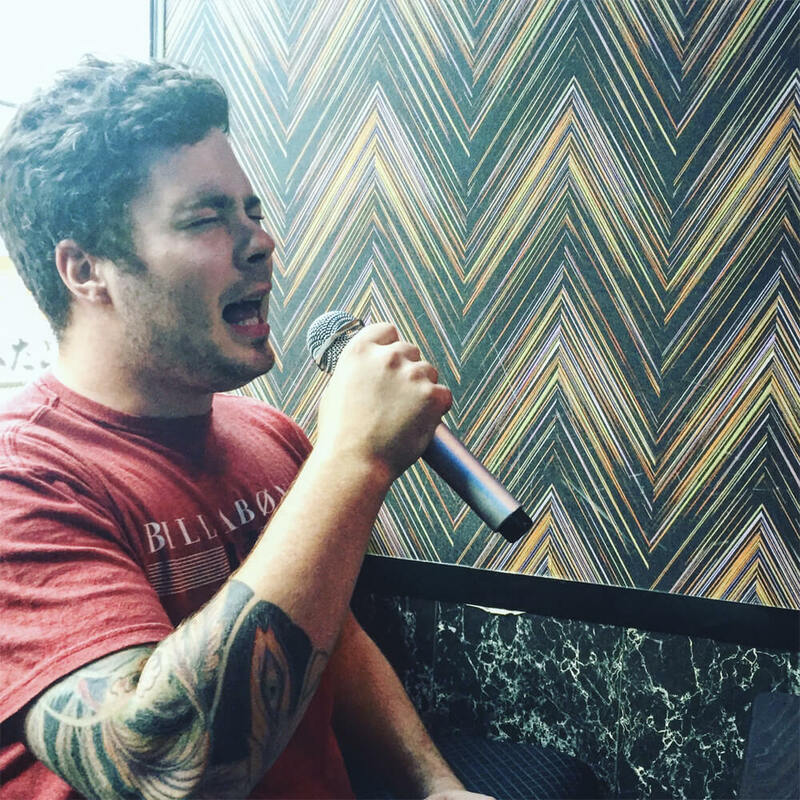 Japanese karaoke (similar to Korean karaoke spots) have tons of English song selection so you’ll be sure to find a familiar tune you can blast out. We found out later that Karaoke Kan is the location of Bill Murray’s singing lesson in the movie Lost in Translation. BOSS COFFEE! from any number of vending machines in Japan. There’s really a vending machine on every corner in Japan. 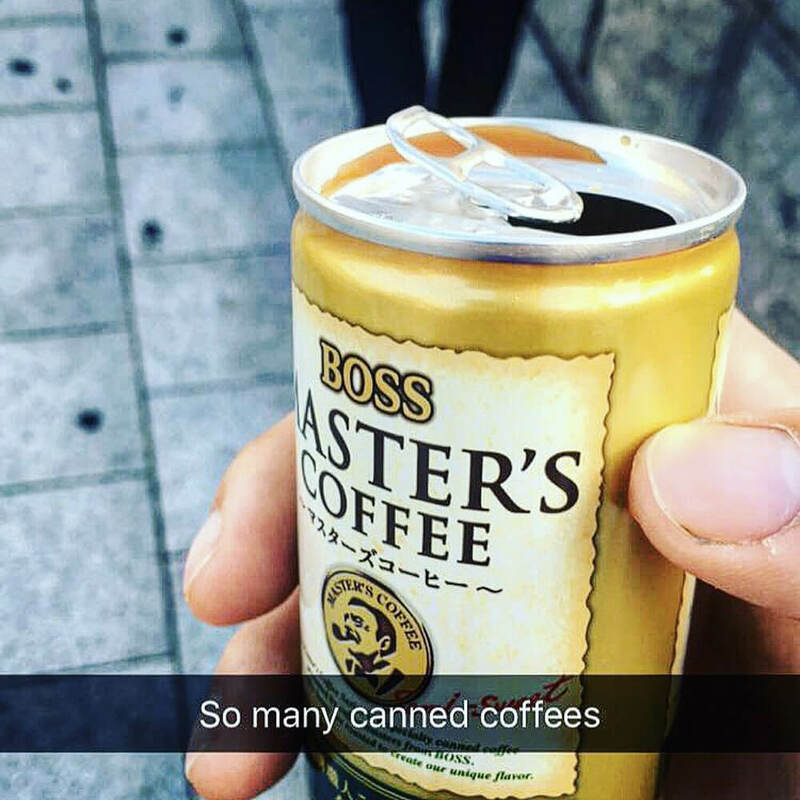 First thing’s first, try the cold and hot BOSS coffees from the vending machine. Also try their funny drinks (one is called “sweat” but it’s just water lol). In certain areas, you’ll find vending machines selling snacks, ice cream, even souvenirs! On our last day in Japan we tried to get rid of as much change as possible through vending machine purchases. 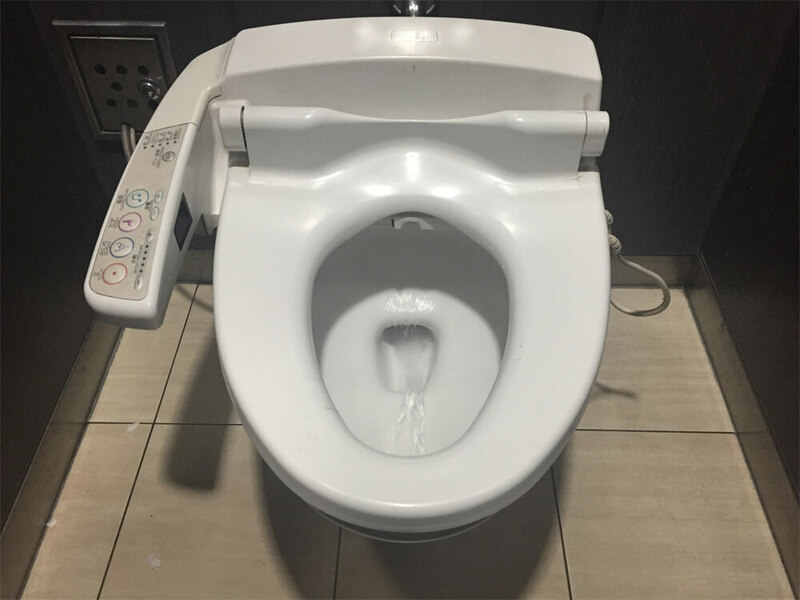 We basically used public bathrooms whenever possible – in fact we preferred using them over the bathrooms at the AirBnBs we stayed at because Japanese bathrooms – fully equipped with bidets, sprayers, odor maskers, and music or birds chirping while you do your thing is amazing. Mike is addicted to bidets especially and is now planning on installing one for us this year! Just be careful, most bathrooms don’t have paper towels or hand dryers so invest in a handkerchief (there’s lots of cute designed ones in Japan!) for drying off, and watch for some bathrooms may only offer squatting toilets which is not the best. The Shinkansen Bullet Train travels 300 km/h. 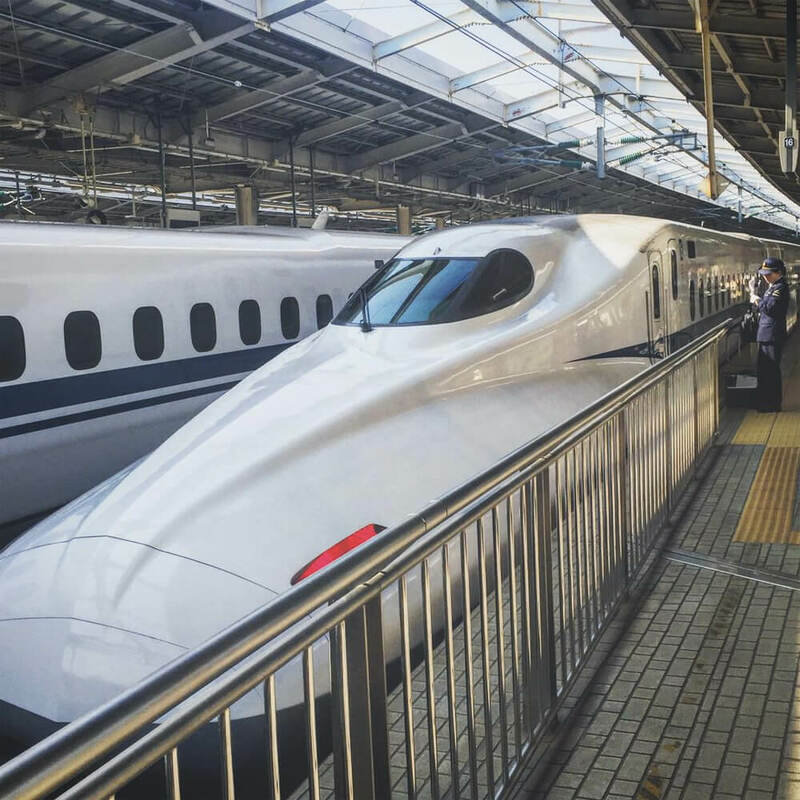 If you’re traveling from Osaka to Tokyo or vice versa, which I think is a pretty typical part of a Japanese trip, be sure to travel by Shinkansen high-speed bullet train. These trains travel at up to 300 km/h. Pay the extra bit to get reserved seating (roomier) and non-smoking. It’s a smooth ride across Japan’s countryside. I came across this ninja school experience and was so tempted to sign us up but wavered at the cost – even though the many reviews said the price was worth it! It would’ve been great to see sumo wrestling live! Kyoto was packed with people doing kimono rentals – it looked so fun and so pretty, I wish I had rented one when we were in Kyoto! There are lots of different stores you pass in Kyoto that offer this, or you can book tours/rentals in advance. We went during the early fall because of the seat sale but it’s really supposed to be unreal in the spring when the cherry blossoms are in bloom. We walked down the Meguro River in Setagaya which is a popular spot to view 800 cherry blossom trees (had they been in bloom), and wished we could’ve seen it all pretty in pink. Apparently there is a blossom bloom in late October / early November too but we missed that as well. We really wanted to do Japanese hot springs (onsen) but it turns out if you’re tattooed in Japan, you get turned away from most onsens primarily because of the old world thinking that people with tattoos are gang members and will cause problems at your hot spring. Boo! You can get damn good seats at a Japanese baseball game for a very low price so check if there are games happening during your visit and spend an afternoon or evening at the stadium! Our baseball loving friends wanted us to catch a game but we just did not fit it into our itinerary. While we did go to the famous Tokyo Tsukiji Fish Market, we did not get up early to do the famous tuna auction which I’m told is an amazing thing to witness. Because it’s actually a working wholesale fish market and was never meant to be a tourist attraction, the number of visitors to the famed tuna auction is limited to 120 per day so if you want to see the action you need to apply to be in the 120, starting at 5 a.m. It’s first come first serve, and people generally start lining up hours before 5 a.m. It’s just hard to get yourself up that early on holidays… lol, but if you can, it’s apparently quite the experience. We didn’t visit as many shrines or temples as we could’ve – for sure. If you look at any district guide for Japan, this temple or that shrine are typically in the list of things to check out! Mike isn’t really a shrine guy and admittedly, they all start to look pretty similar after awhile, but on a return trip I would like to incorporate more of that into the itinerary, it definitely would’ve brought more calm and quiet to the trip too. 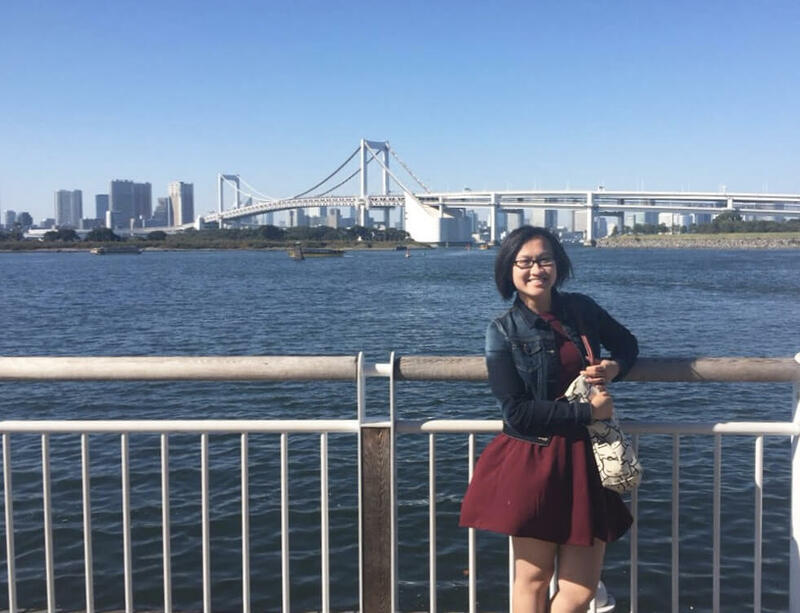 And here are some other tips on traveling in Japan! We decided to stay at AirBnBs during our time in Japan. It was our first experience using AirBnB but certainly not the last! Super convenient and very affordable, choosing AirBnB gave us a nice true Japanese experience at a great price. Be sure to browse and book early (we didn’t start looking until a month out from our trip and found that a lot of really cool looking places were already booked up). Get pocket wi-fi! This cannot be understated. We would have been so lost without access to Google throughout our trip. As soon as you get to the airports in Japan, you’ll see a lot of pocket wifi kiosks. Ours cost about $80 for 10 days, and it was unlimited and it was amazing. Such a simple concept, I feel like all countries / airports should offer pocket wifi and then you wouldn’t need to pay for any ridiculous travel phone packages! Because of Google and Wi-Fi, navigating the train system in Japan was actually easier than we thought it was going to be. It was incredible how accurate Google Maps is with train stations, lines, stops, and fare information. Anywhere we wanted to go we would just type it into Google Maps and it would tell us exactly what station we needed to go to, what line to take, how many stops in between, etc. A Godsend, really. The Japanese train system can feel overwhelming at first but with pocket Wi-Fi and Google Maps we always felt confident on where to go. It helped as well that we purchased a Kansai Thru Pass for our three days in Osaka/Kyoto and a Tokyo Tourist Metro Pass for our stay in Tokyo. Our Osaka AirBnB host Masa actually recommended we get the Kansai Thru Pass and then we looked up the Tokyo Metro Pass after realizing how easy having such a pass made transit. Both passes basically saved us a lot of time and money while we hopped on and off trains throughout Osaka/Tokyo. It was sometimes limiting, as some lines didn’t fall under the passes eligibility, but for the most part the passes made transit so convenient! If you are doing a Osaka / Tokyo kind of trip, I would recommend looking into and purchasing a JR Pass in advance of your trip as well – as it will likely save you some money and give you more added convenience when taking the train system. Similar to the Kansai and Tokyo Passes though, some lines will not be accessible with the JR Pass so whatever option you end up picking, you’ll likely still need to pay for some miscellaneous trips here and there. No matter what pass you do, or how much you end up paying per train trip, don’t worry about not picking the right fare selection or having the right ticket. At first we were confused as to how much we needed to pre-pay to get to certain stations, or sometimes depending on the station you stop at or transfer through to, you don’t actually need to pay to get in between stops. That’s all taken care of at your final stop when you leave, there are Fare Adjustment machines at every station that lets you pop in your original train ticket and it will tell you how. I have you owe before you can leave the gates. Settle your fare there, no big deal! The biggest ones you should have in your arsenal: thank you (domou, arigatou, arigatou gozaimasu), excuse me (sumimasen), and sorry (gomen) – that one was mostly because everywhere was so crowded I ended up knocking into a lot of people as I walked, lol. Perhaps most frustrating for an early riser like myself is that I would get up at 7 a.m. each day, be ready to start the day by 8, only to find out that basically nothing is open in the morning, save for a few coffee shops. Most restaurants don’t open until 11 a.m. so you’re likely better off hitting up some scenic, touristy spots in the morning before getting food in you. What an amazing, super memorable adventure! Check out more photos from my trip on my Instagram feed. So have you been to Japan? Would your “top things to do” match up with mine? What am I missing? Leave a comment below! Oh! Thanks so much for this post! We are heading out to Tokyo in a month and a half and this info is really going to help! I know your Japan vacation was 2 yrs ago which I was there, I absolutely fell in love with JR Rail / Bullet Train system (very similar to Hong Kong MTR) they are very on time by the “Exact Second”. There were lots of Sushi/Sashimi; Yakitori Grill houses in Tokyo & Shinjuku area; there’s actually a Standing Ramen restaurant where you stand and eat. I have to say Linda that comment about “Onsen” is very In-Correct, as I visited and stayed 4 nights at Gero Onsen; took me almost 4.5hrs from Tokyo Bullet Train into Nagoya than JR Trains into Gero Onsen.